Looking for fitness equipment that feels great, is reliable, lasts for years and keeps you engaged? 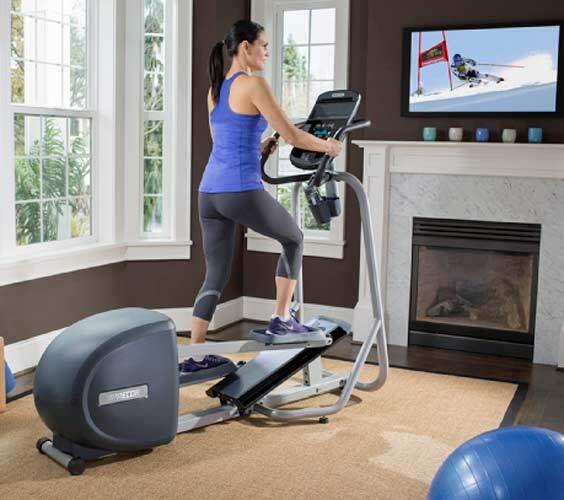 The new Energy™ Series Ellipticals provide a fitness center quality workout in the convenience of your home. With technology adapted from our commercial-grade models, these ellipticals have design and convenience features that will help you reach your fitness goals faster and enjoy your workouts more. Focus your workouts on toning muscles while building cardio endurance with the EFX® 221. This Elliptical Fitness Crosstrainer™ provides smooth, natural, low-impact workouts that help you get results. Select 3 ramp angles and 3 stride lengths with the manually adjustable CrossRamp®. And with stationary handlebars that focus workouts on your lower body, the 221 is a proven cardio and toning powerhouse. With Precor patented adjustable CrossRamp® technology, you can alter the height of the elliptical path your foot travels. Called Variable Stride Geometry™, this allows you to focus on a specific muscle group or all major lower-body muscle groups, so you can work the muscles you want, when you want. Combination water bottle/ remote control holder. Console Type High contrast blue-white LCD. Acrylic overlay. User IDs User IDs allow you to quickly retrieve the most recent workout and also lets you select the default workout duration and provides the most accurate calories and target heart rate calculations. A great option for households with more than one user, so you each can store your preferences. Options Key Yes, DURING your workout, "Workouts" key lets you change your workout type and "Enter" lets you change your duration, age and weight.